Consumer demand for organic, natural products continues to grow. The H2O Express™ process pasteurizes your product and packaging, providing a 5-log reduction in the pathogens of concern. The process has been approved by Technical Expert Review Panel (TERP) of the Almond Board of California for processing almonds in boxes, bins, totes, tri-walls, sacks and supersacks. The process has been validated for a number of other spices and nutmeats. 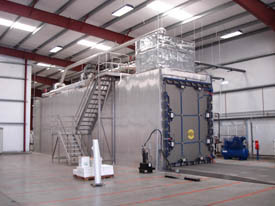 H2O Express is a batch process which is performed prior to shipping products to market. Because product is pasteurized in its final packaging the opportunity for recontamination during subsequent handling and storage is eliminated. You can ship H2O Express™ pasteurized products with confidence. Our pasteurizers are custom built to meet your specific throughput requirements. Machines as small as a refrigerator and as large as four tractor trailers are available. Unlike other steam pasteurization processes, our patented system based on sub atmospheric pressure ensures that product water activity and quality are not affected by pasteurization. Pasteurized product looks and tastes great.